Thullal is a dance form which is unique with its simplicity in presentation and humor. It strictly follows the principles that have been mentioned in the Natya Shastra written by Bharatamuni. There are three varieties of this dance form namely Ottanthullal, Seethankan and Parayan Thullal, but Ottanthullal dominates out of these. Thullal is performed as solo and is conducted during temple festivals from the temple premises. It involves music also and the themes for the play are obtained from myths. Even then social criticism is a main feature of this dance. The songs are very fast and are written in Malayalam and involve humor and wit. Along with the dancer, there is also a singer who repeats the slokas. The musical instruments used in this play include Mridangam, Maddalam and Elathalam. The performer is called as the Thullalkaran. It was the great Malayalam poet Kunchan Nambiyar who introduced Thullal in the 18th century. It was through his efforts that humor and wit became a part of literature and was introduced to the common man. This dance form shows his sense of social responsibility. The story about the origin of Thullal says that once when Kunchan Nambyar who used to play the instrument Mizhavu for Koothu performances was caught while taking nap during a show. The Koothu performer was angry and he put Nambiyar off the stage. Nambiyar felt insulted and in that anger he created another art overnight and performed it the next evening. That was believed to be the origin of Thullal, but some scholars debated that an art form could not be created within an overnight. The makeup is similar to that of Kathakali. The face is painted with green color, lips with red and eyes with black. The cloths include red and white colored knee length skirt and are tied around the waist. There is also a colorful headgear. The costumes for all the three types of Thullal vary. 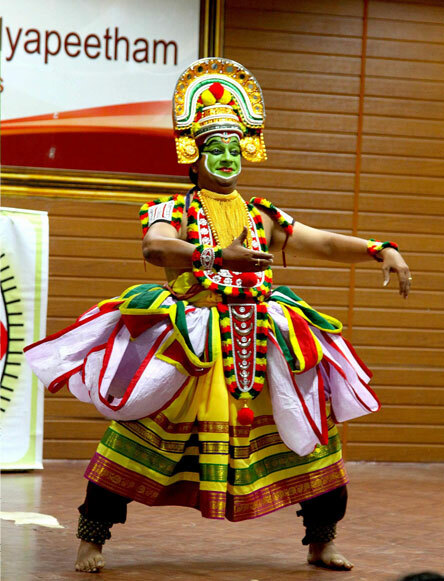 This dance form has been influenced by ancient dances like Chakyarkoothu, Koodiyattam, Patayani and Kathakali.